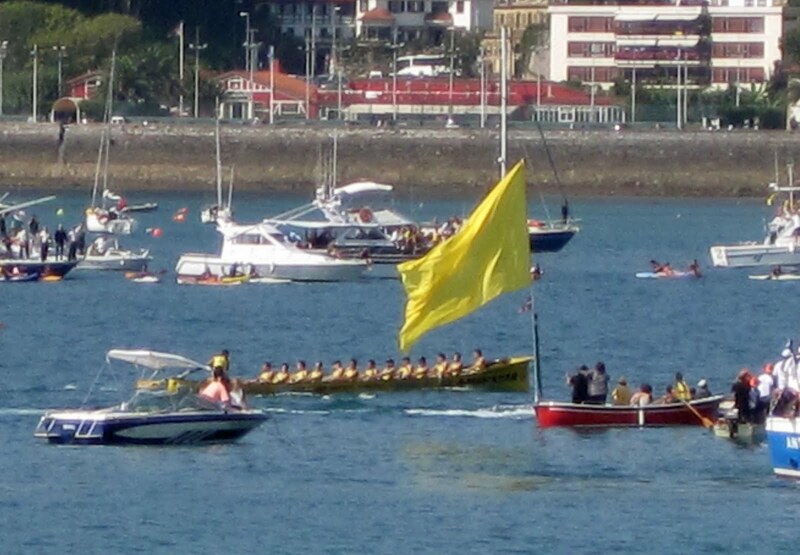 Last weekend, Donosti was host to the most popular rowing contest in the Cantabrian Sea - La Bandera de la Concha (The Flag of the Concha). 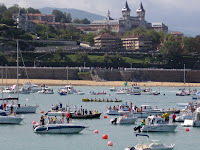 Each year, over 100,000 people flock to Donosti, sporting thier team color to cheer on their favorite rowers. 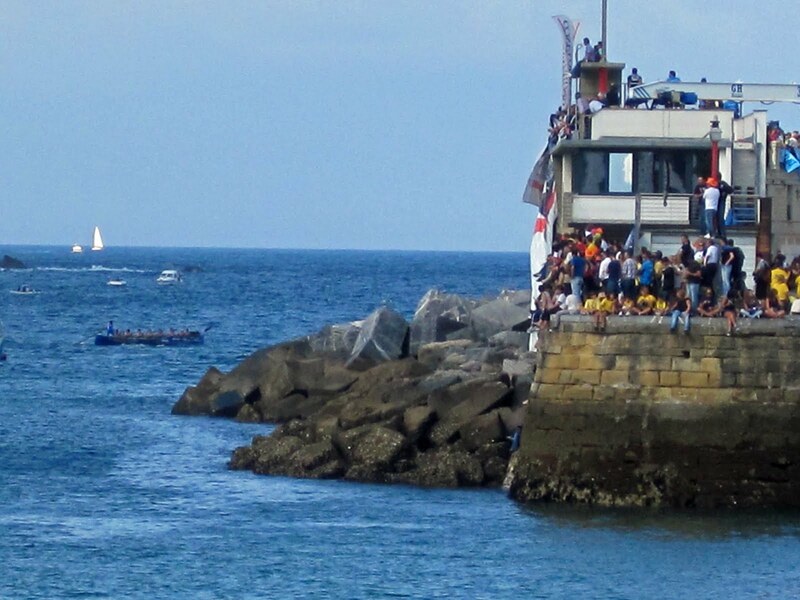 Although many rowing teams throughout the Basque Country and other parts of the Cantabrian Sea try out, only 8 race for the Flag. The competition takes place over two Sundays, so as to make sure everyone gets a fair shot at lanes and good weather. The first Sunday, I watched the races on TV, so when I arrived on the last Sunday, I had a pretty good idea of the teams, rowers and thier times. The times from the two Sundays are added up after the two-heat race and that is how the winner is determined. Dressed in yellow, Orio's color, I made my way at 10am with Heather (dressed in pink for San Juan) to the port with our bottles of Basque cider in hand. 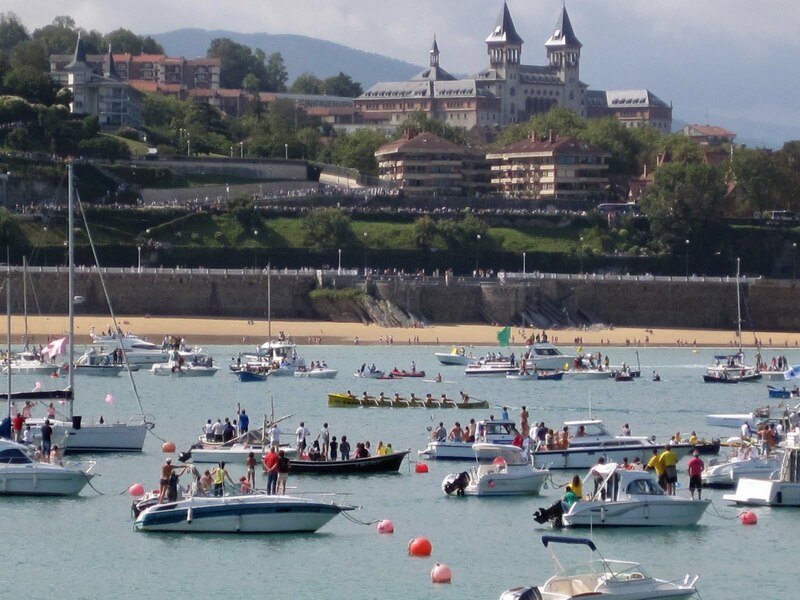 Not only are the regattas a reason to watch rowing, but like any other Basque festival or party, it is a reason to eat, drink and be merry with your friends. The races actually start at noon, but we arrived early to make sure we secured a good spot. The best is to watch it on tv becuase they you know the team times and can see the paddle by paddle action as they row out of the Bay into the Atlantic and back. But, being outside with the people, all crazily cheering for thier teams makes for a better atmosphere. Well, I take that back - the absolute best place to watch it would be from a boat in the Bay, but seeing as I don't have a boat, that wasn't even one of my options. Although the announcing was in Basque, I was able to keep up with some of it - having learned the words for 1st, 2nd, 3rd, and 4th. At the beginning of the day, Orio was in 6th place, but with some luck and probably extra work from the big-muscled rowers, they managed to finish the race in 2nd place. ¡Aupa Orio! A team from Vizcaya (the neighborhing Basque county) won - it's nice a Basque team had won, but it would have been esepcially great if someone from our region (Guipuzcoa) won, or Orio even better yet. But regardless of who wins, everyone heads to the Old Part after to celebrate. At one bar, the Urdabai (winning team) fans started chanting for thier boys, and while I'm not Basque nor from Orio, I was wearing a yellow shirt and felt obligated to shout for Orio. All in good fun, I shouted Aupa Orio (kind of like Go Orio!) and they all started laughing and hugging me as I headed towards the bar. Why didn't I cheer for Donostia you may ask? Well, let me tell you. Each year, only 8 teams race, but really only 7 qualify. Great times are expected to qualify and it means the world if a lesser team makes it into the final 8, but Donostia always makes it in. Although they are bad, they claim that since the race in held in thier Bay, they are entitled to race every year - qualifying time or not. 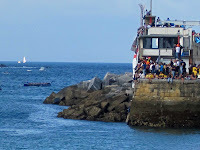 The funny thing is that although this race is almost the 'Olympics' of rowing in Spain, Donosti never even gets close to winning on thier waters. White shirts for the Donosti team are scare, and as the fast paddling teams whiz into the Bay, Donosti usually cruises in a nice 15 or 20 seconds behind (which is light years in rowing). So, I opted for Orio and was quite happy with the choice. A rowing constant, this competition has been on the books for 128 years. Besides a few years in the Spanish Civil War, rowers have been vying for the Flag of the Concha for over a century, and I assume will continue to aspire to it for years to come. While there is an actual rowing season, with wins, losses, etc, all of that goes out the window at Concha. Whoever wins this race are the rowing Gods til the next year. Between pintxos and Basque wine (txakoli), I was quite tired by 7pm and headed home. While I have lived here for two years, I somehow managed to miss both regattas that I have been here for. 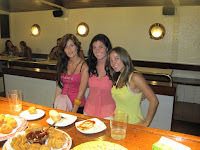 Finally make it was great - a sunny day, friends, delicious food and drinks and a water sport - all things Basque.